Discussion in 'General Reef Aquarium Discussion' started by Charlie and Abigail, Nov 22, 2018. I’ve always fought nitrates in my 32g BioCube. I would like to get maceoalgae going in my tank but not sure I have the room. Top houses my horizontal heater & 2 pieces of black sponge, 2nd level has 2 pieces of green filter moss and my bag of phosphate bag to lower phosphates, 3rd level is another piece of green filter moss. Chamber 3 has nothing but does house my stock wave maker, tubing and the stock water pump. The question here is, what do you expect to gain by adding a refugium to your tank? I'd say just about all of these "use part of the built into tank filter system" or "hang on the tank" refugiums are far to small to do any real good. You can still add it. It will not hurt anything. 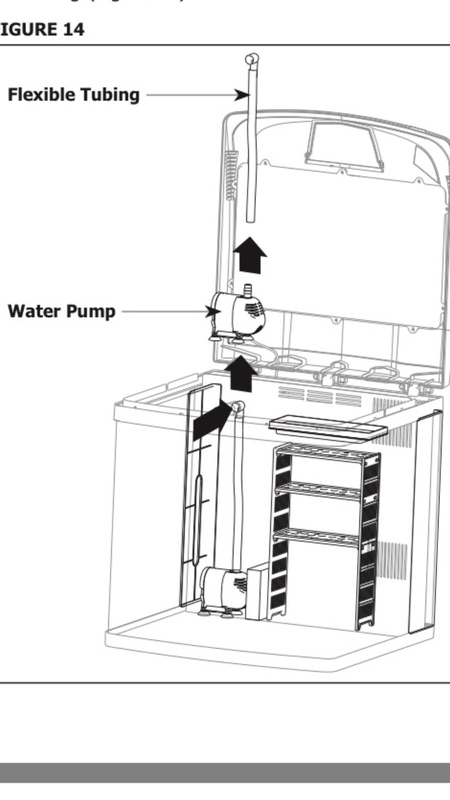 If you want a refugium that is going to do some real good, think in rough terms of the refugium being about 20 to 35% of the main tank volume and plan on plumbing this additional tank into the system. That's ok though because the refugium often does have a lot of interesting things going on inside it. If you only have that small area in the filter to work with, consider building an algae scrubber, which will get more out of the small space. Thanks Dave...I was hoping to try and grow some macro Algae. Heard it was good for keeping nitrates down and that it was something I could also turn around and sell to my LFS. I’ll check into an algae scrubber but I don’t really have an algae issue. As a follow up, I would add that while you want to read up on such things as a refugium and algae scrubber, don't get or build anything unless you really need it and it's going to make a major improvement in your system. Also, keep in mind that a 10 gal water change will reduce the nitrates and phosphates by 1/3. This is one of the advantages of a smaller tank. You can often maintain or fix parameters with a partial water change. Oh really good news we only lost one fish! When cleaning out my media chamber from nitrate rocks and changing my phosguard I found my Royal Gramma! It had been in the back part of my tank for about a month or so!!!! Can not believe it is still alive.